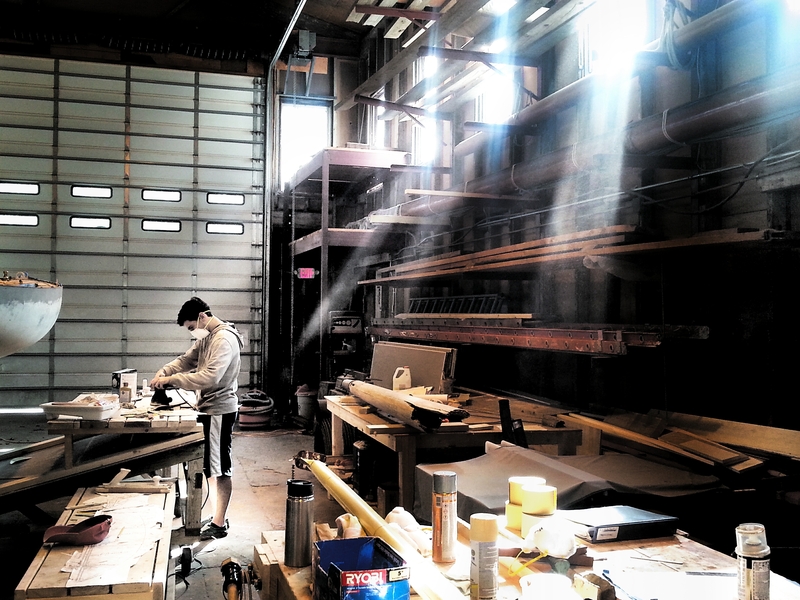 Joan Perkins of Padanaram Sign Shop & Boat Lettering has given our model life; having a name on the stern makes RELIANCE feel all the more real. It seems to be one more indication that we’re approaching the goal line. Joan came to us highly recommended by neighbor Dan Shea, and she’s everything he said and more. 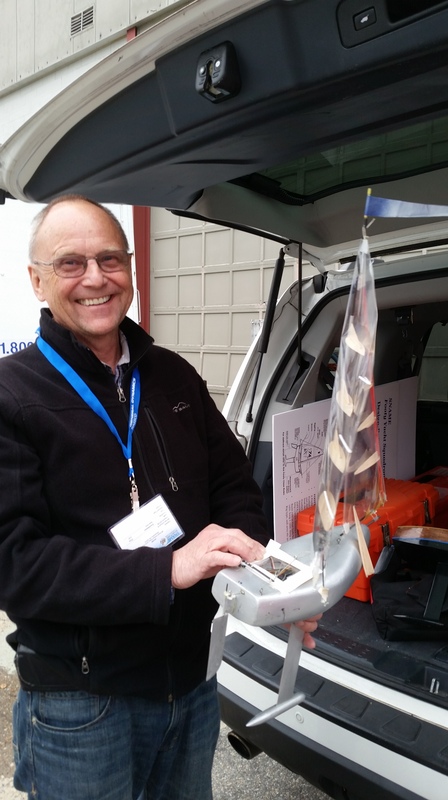 So many of our local business “volunteers” are the best in the game! Thank you, Joan! We’ve finished up a large majority of the blocks, so we’ve got Bern constructing stairs for our RELIANCE Display. Joe is touching up the deck; after all this time working, plenty of dust and assorted undesirables ended up topside. Meanwhile, Don has been working on the new steam exhibit as well as providing the RELIANCE project with an extra steady pair of hands, as required. The boiler, fire box, and ash pan will complement the stem engine he has restored. 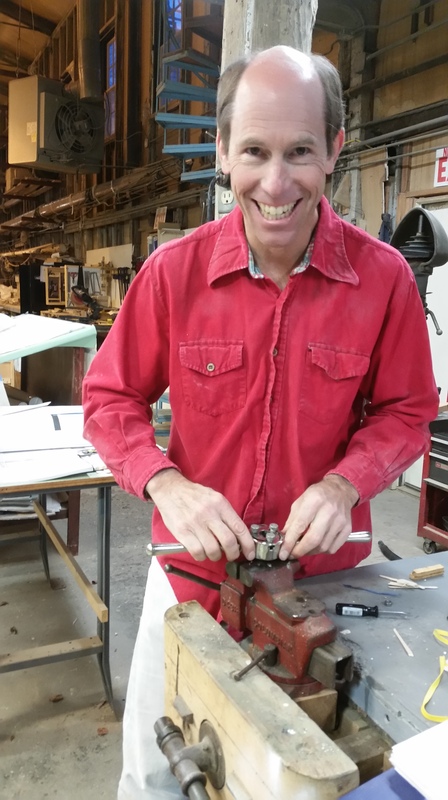 This entry was posted in Project Manager's Welcome and tagged America's Cup, bench, blocks, boiler, Bristol, building 28, don, Herreshoff, Herreshoff Marine Museum, HMCo, padanaram, paint, RELIANCE, Reliance Model, RELIANCE Project, Sandy Lee, steam engine on January 27, 2016 by Herreshoff Marine Museum/America's Cup Hall of Fame. 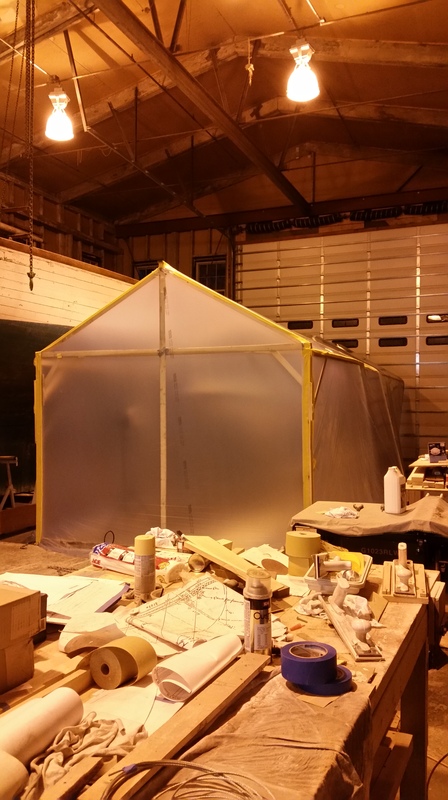 After erecting a new tent fitted with a ventilation system, the group got to giving the model its sleek paint job. 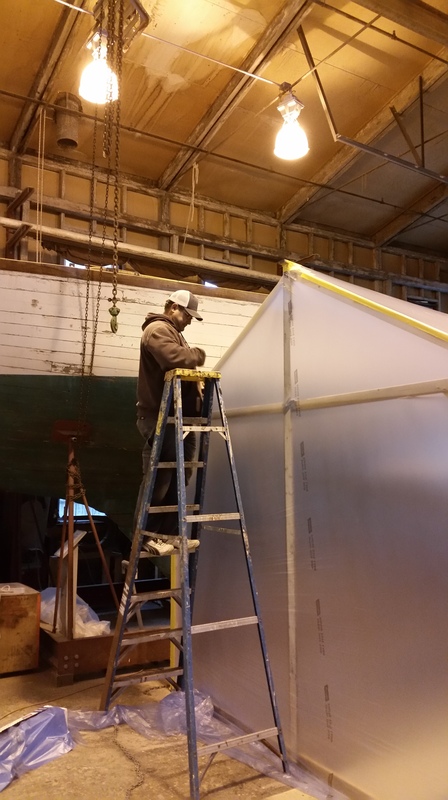 Buck and Don painted the topsides. They painted the bottom a golden bronze just like the polished bronze plates on the original. 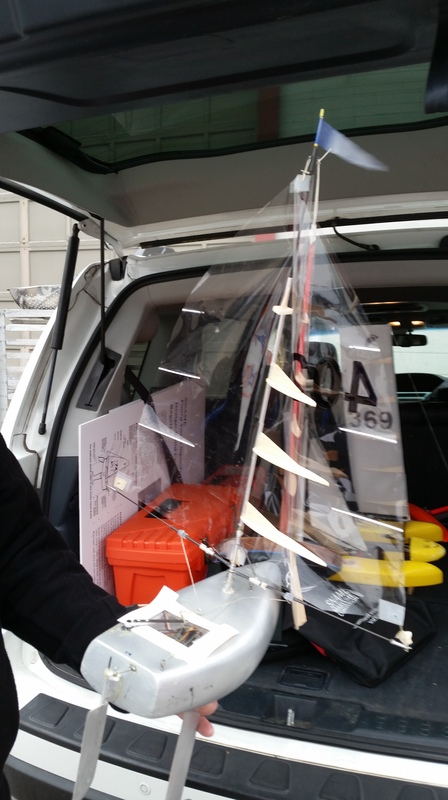 This entry was posted in Builder's Notes & Pictures and tagged America's Cup, Bristol, buck, building 28, don, Herreshoff, Herreshoff Marine Museum, HMCo, hull, itchiban yacht painters, paint, painting, RELIANCE, Reliance Model, RELIANCE Project, Sandy Lee, topside on December 17, 2015 by Herreshoff Marine Museum/America's Cup Hall of Fame. To honor the holiday upon us, we in the RELIANCE Project would like to thank all who have helped us on this long, arduous journey, as well as all the fans who have pushed us on with your words of encouragement! To give back to the community, here’s a look at the RELIANCE model, sleek and suave from its final priming! We’re going to be dabbing on a “blue-ing” film and sanding off the “orange peel” with 400-grit sandpaper very soon. 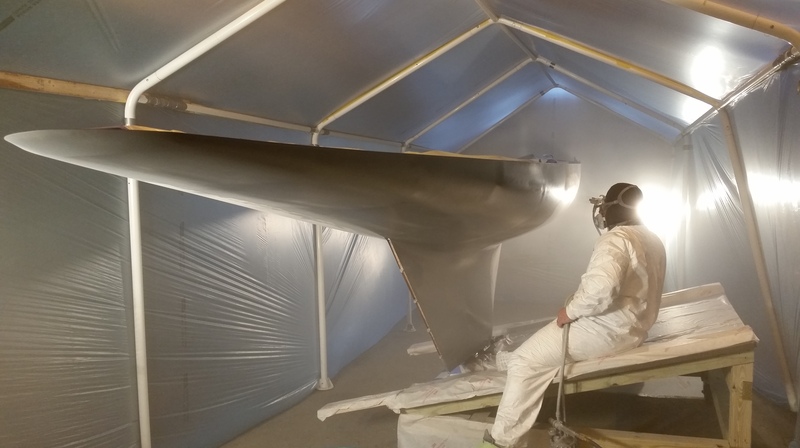 This entry was posted in Project Manager's Welcome and tagged America's Cup, boat, Bristol, buck, building 28, Herreshoff, Herreshoff Marine Museum, HMCo, Keith Bradley, paint, painting, RELIANCE, Reliance Model, RELIANCE Project, ri, Sandy Lee, ship, Steve Siok, tent on November 26, 2015 by Herreshoff Marine Museum/America's Cup Hall of Fame. Finally: The Painting Has Begun! 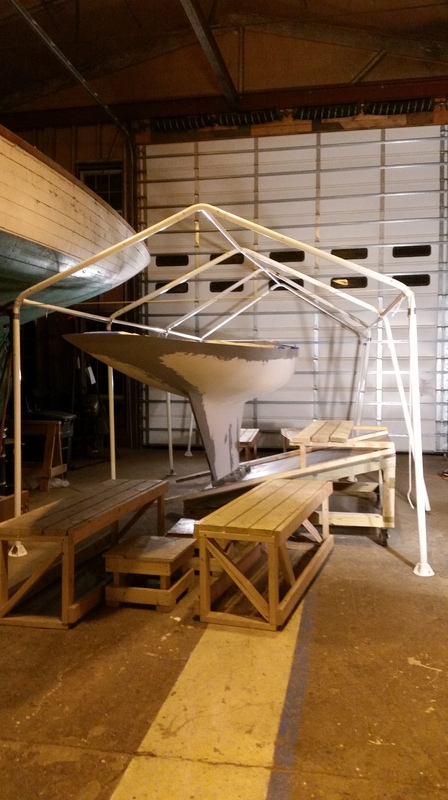 Early last week, Keith, Herb, Steve, and Sandy erected a tent frame to put the RELIANCE model under. 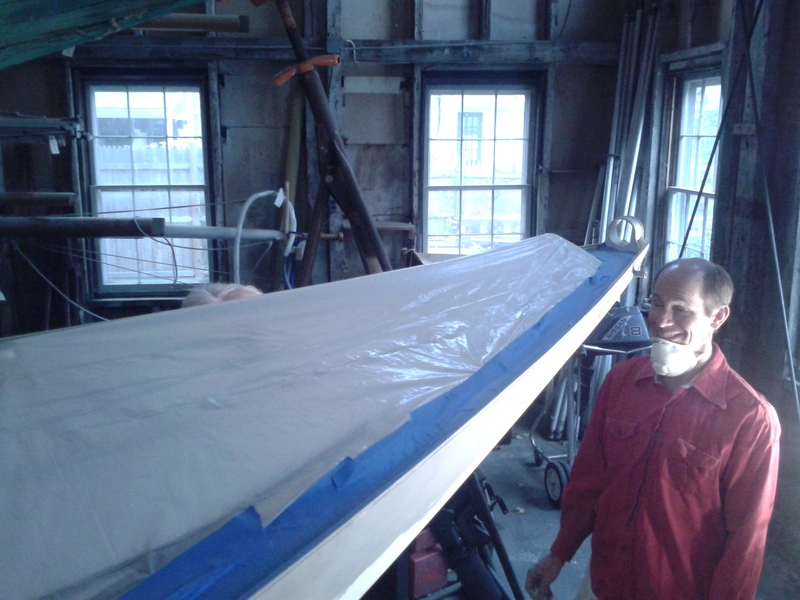 Buck from the world-renowned Itchiban Yacht Painters stopped by to form the actual tent. 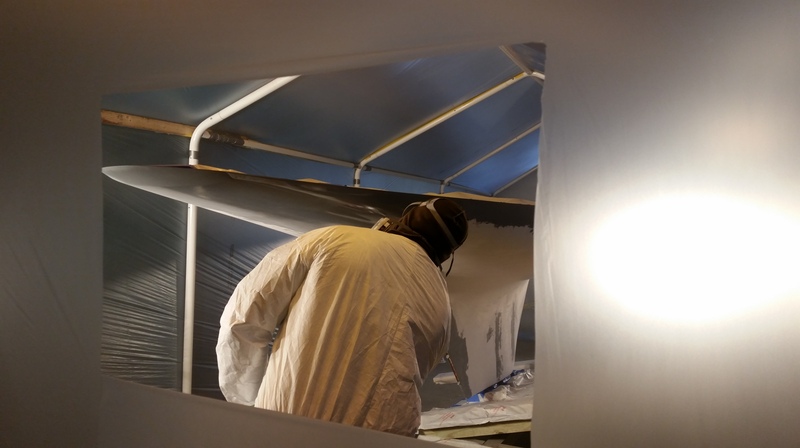 On Thursday, Buck returned and put the first five coats of primer on the boat. 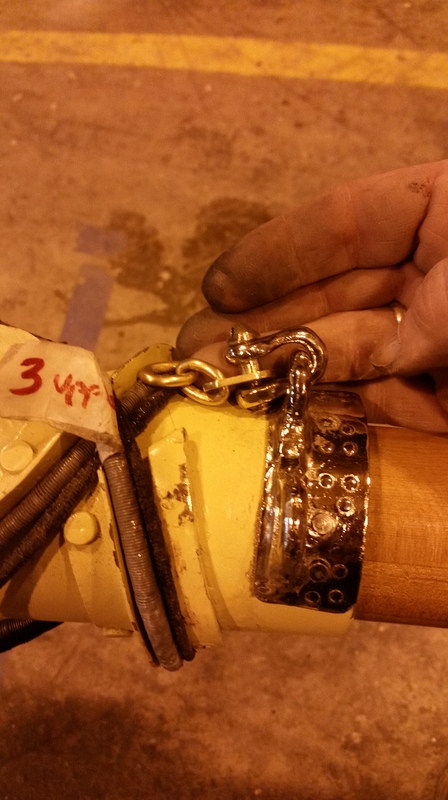 Buck says he’ll come back on Monday with another person to block down the shear and keel, though he thinks it is “good enough.” I sense he’s really bought into our boat and it is now his boat! 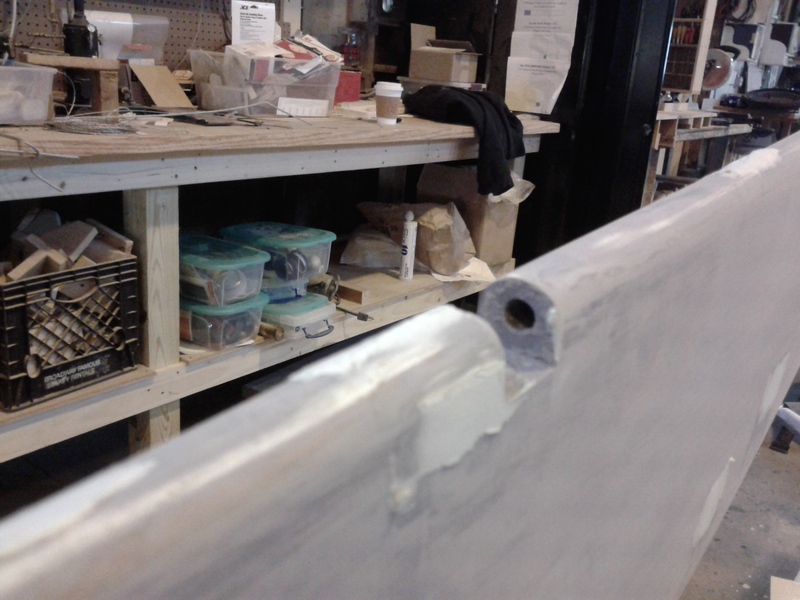 On Monday, the plan is that he’ll “block” long board the hull with 150 grit and then put another 3 coats of primer on. We will then sand to 400 grit and he’ll return for finishing coats. 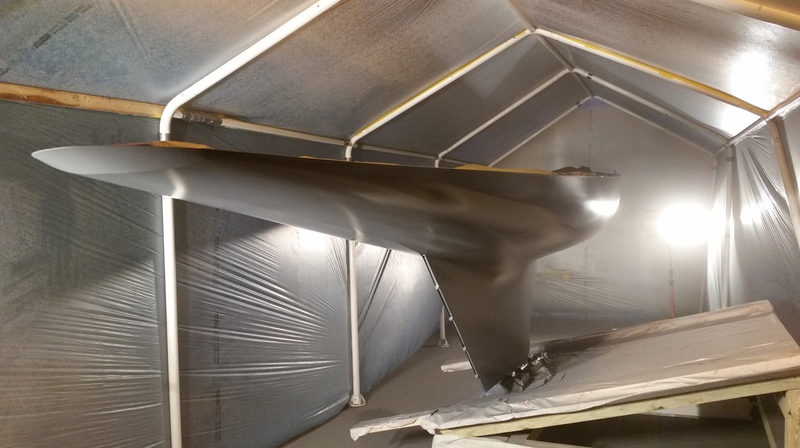 This entry was posted in Project Manager's Welcome and tagged America's Cup, bern, Bill Lawton, Bristol, bruce, building 28, Burr, deck, fairing, herb, Herreshoff, Herreshoff Marine Museum, HMCo, hull, itchiban, keel, Keith Bradley, paint, painting, priming, RELIANCE, Reliance Model, RELIANCE Project, rudder, Sandy Lee, steve, tent, yacht, zach on November 16, 2015 by Herreshoff Marine Museum/America's Cup Hall of Fame.